Through Microsoft Exchange 2010 EDB to PST software all Exchange users can superb extract Exchange 2010 file to PST and successfully re-open Exchange EDB file with all emails metadata - To, Cc, Bcc, Date, Subject and Time etc. It can efficiently export Exchange 2010 EDB file database and fix EDB file to PST without affecting any internal coding HTML, RTF, TXT etc. Get best and relevant solution of 2010 Excel file password recovery tool to crack Microsoft Excel file password and recover MS Excel password 2010. 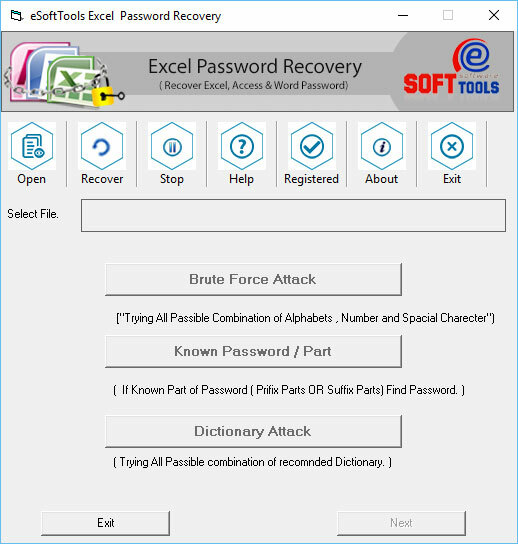 Quick recovery Excel file password 2010 with safe Microsoft Excel file password remover 2010 program. This tool has great ability to know how to crack Excel file password and recover MS Excel file password 2010 smartly. If you lost excel 2010 password and you want to unlock excel 2010 spreadsheet password. So you don?t take any tension, because PDS launched 2010 excel unlocker program which can helps to user for unlock excel 2010 spreadsheet password and remove excel file password 2010 safely and smoothly. 2010 Excel unlocker tool works with two types of methods brute force and dictionary attacks. If lost access from your Exchange EDB 2010 then instantly grab 2010 Exchange EDB to PST repair tool, to repair corrupted EDB 2010 and convert 2010 EDB to PST. Always adopts secure way to restore EDB 2010 emails and export EDB to PST. Entirely data recovery and EDB email conversion process becomes so much simple with this GSTECH 2010 Exchange EDB PST Converter tool. Grab FREE Download now for evaluating the software. Exchange 2010 mailbox recovery software is one of the best tool for instant and smart 2010 Exchange recovery. It allow you to repair exchange 2010 EDB file and recover Exchange mailbox 2010 into Outlook with emails items, contacts, tasks, notes, calendars, journals etc. This Exchange 2010 EDB recovery software works on such EDB file versions-5.0/5.5/2000/2003/2007/2010/2013. Outlook 2010 OST to PST Converter software restores emails from unreadable OST file. It works against downtime Exchange Server to easily migrate Outlook OST email into PST emails for MS Outlook 2019, 2016, 2013, 2013, 2010, 2007, 2003, 98 and 97. You can easily save unreadable OST file into PST, HTML, EML or MSG file using OST to PST Converter software. Recover Excel 2013 password by using best 2013 Excel password recovery software. This is the finest solution for removal of lost Excel password, Word password and Access file password. It works with excellence to unlock Excel 2013 password without any issue. It supports all Excel versions and works on all Windows versions. Download PDS 2013 OST Converter Software to recover OST file outlook 2013 and convert OST to PST 2013 with original messages formats- TXT, HTML & RTF formats. With the help of OST to PST Converter outlook 2013 Software you can Convert OST file to PST File with full attachments- Inbox, Outbox, Sent Items, Deleted Items, Draft, Journals, Tasks, Calendars, Notes & Contacts in just few minutes. It works on OST version up to 2013. Without any harm you can access Outlook OST file 2013 and speedily recover OST to PST 2013 by brilliant OST recovery to PST tool. Make use of PDS OST to PST 2013 exporter program for exporting OST to PST 2013 file accurately. Now you can easily recover 2013 OST file and convert Outlook OST file to PST file 2013 with best 2013 OST to PST converter tool. Take 2-3 minutes to recover OST file 2013 and extract OST PST 2013 with every email Meta data. Move ahead Outlook OST Recovery solution use to recover and repair unusable off-line storage file. Now user can easily use Outlook OST Recovery with Outlook 2013 ? 95 to easily restore emails from OST files and runs with old as well as latest all edition of Windows OS like Win 8, Win7, Vista, XP etc. so you can called complete Outlook OST email recovery application.